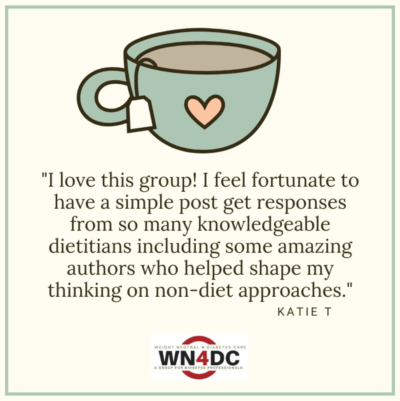 On social media, a dietitian posted she could no longer be an “anti-diet dietitian.” Her post from the WN4DC Professional Facebook group received more than 50 comments which affirmed how challenging it is to let go of diet culture. This quarter’s theme is about resistance which presents an excellent opportunity to explore the struggles of leaving a weight-centered paradigm. Your personal experience about your life, your privilege, and how this informs you. Your professional experience regarding what has been effective for you at work. Your professional knowledge and beliefs regarding how you see nutrition and health. How were you taught about Intuitive Eating (IE), Mindful Eating, Health at Every Size (HAES), and Weight-inclusive Counseling? Your understanding of a weight-inclusive or weight-liberated/Health At Every Size perspective. The written documents created regarding these philosophies (Principles of Mindful Eating, the IE Principles, and HAES books). Your ability to ask and receive clarification regarding these specific approaches. Other professionals’ reactions or comments who participate in these communities. Unpacking these eight separate topics begin with exploring your personal experience. There is no universal way to do this, and for many in the nutrition/dietetics field, one of the hardest things to accept is your experience is unique. Many of your peers can relate to your situation, but your experience remains unique. This can create a sense of isolation, and it can drive an individual to make assumptions because the most profound human desire is to belong. Many things shape your professional knowledge and beliefs. Your experience shapes your views just as your beliefs shape learning. They are two sides of the same coin, so it makes sense you may mistakenly see this as a singular issue. Your beliefs matter because they drive research and research drives you to question what you believe. Supervision and small safe learning environments provide the structure to challenge your assumptions and experience. These conversations allow you to unpack your learning, explore your privilege, and understand how it informs your work. There are many ways to expand your learning, and the Mindful Dietitian website offers a listing of these programs. How can you evaluate your overall understanding of a weight-inclusive or weight-liberated/Health At Every Size perspective? Getting stuck in your client’s weight-centric thinking is easy. It is necessary to review the written documents created regarding these philosophies (Principles of Mindful Eating, the IE Principles, and HAES books). Glossing over the information and not letting these concepts touch your heart is dangerous because it can trigger thinking, “That is what I do!” This thought can lead you to change the meaning to fit your own beliefs or views. For example, many individuals misinterpret the Mindful Eating principle “Becoming aware of physical hunger and satiety cues to guide your decisions to begin and end eating” as “Mindful eating is eating when you are hungry and stopping when you are full.” This second interpretation of Mindful Eating doesn’t accurately reflect the nuance of the Principle which focuses on awareness, guidance, and choice. Remember getting the gist of these concepts is not enough to communicate them effectively to your clients. How do you ask for and receiving clarification regarding these specific methodologies for a weight-inclusive approach? The value of peer support is essential to professional growth. 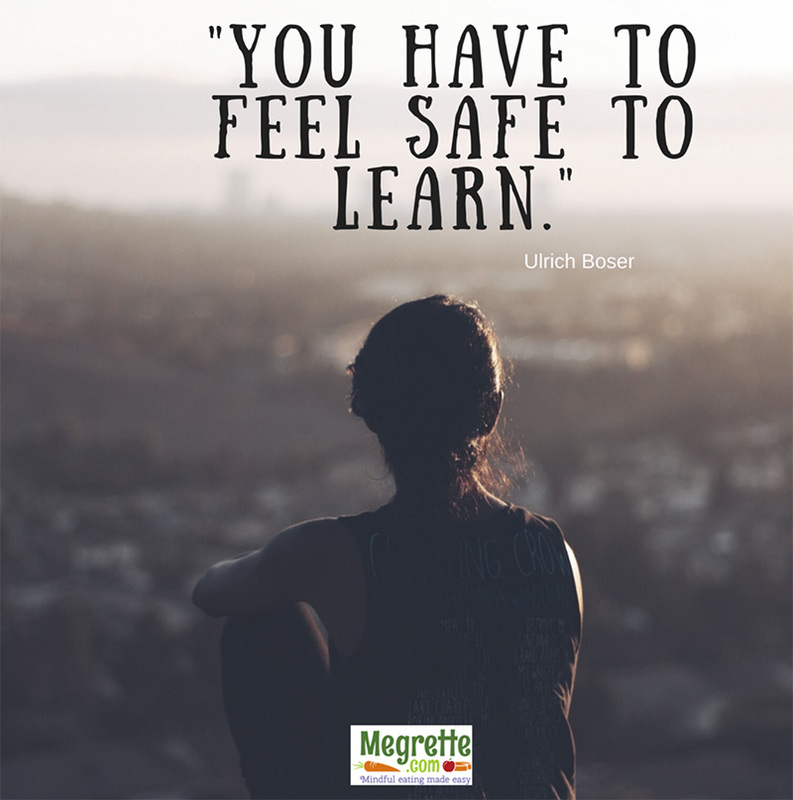 Real learning comes when you are safe to ask, explore, and make mistakes. This is why having both a structured program and professional friendship is necessary. The Mindful Dietitian, Weight Neutral for Diabetes Care and #INSPIRDtoSEEK are examples of supportive, learning-rich online communities. The fall issue of The Thought Compass Newsletter is about resistance, and how your privilege can undermine learning. Many people in the HAES space are speaking about privilege which can produce strong emotions and hurt feelings if misunderstood. Please check out the article, Resisting What You Can’t See,to increase your understanding of privilege. Sometimes learning is hard which is why having support to process the learning and a space to “talk it out” is essential. The expectation that a professional can move from a weight-centered view to a weight inclusive stance in one step is faulty. The human form means everyone makes mistakes. No one is perfect. Permission to be imperfect as you gain a new perspective is a fantastic ‘gift’ to give yourself. Having a community that is supportive and assists you as you advance is essential for your continued growth and well being.